U.S. forces conducted an airstrike Thursday that killed four al-Shabaab militants, U.S. Africa Command announced Friday. The airstrike was conducted in coordination with the Federal Government of Somalia, and occurred roughly 50 kilometers northwest of a port town known as Kismayo, AFRICOM officials said. 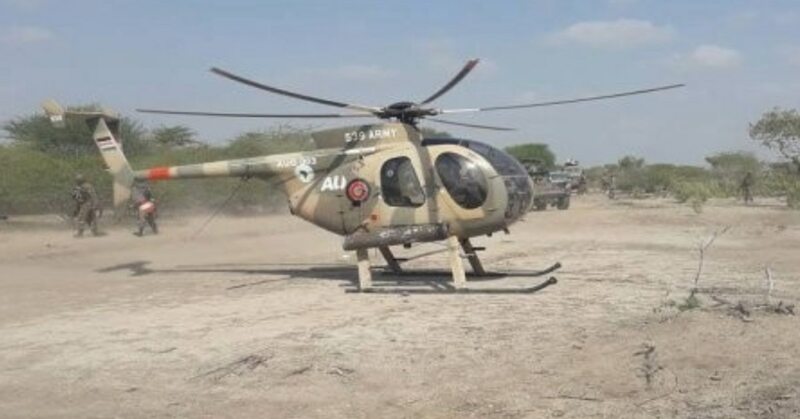 The strike comes a day after U.S. forces and at least one light-attack helicopter marked with African Union lettering provided support to an operation against an al-Shabaab encampment in the same general area. “On Jan. 17, Somali National Security Forces successfully conducted a patrol in Baar and Sunguuni, Somalia,” Robyn Mack, a public affairs official for AFRICOM, told Military Times. Sunguuni and Baar are about 50 kilometers north and northwest of Kismayo. “This was a routine mission designed to further establish [Somali National Security Forces’] presence in the region and deter al-Shabaab from conducting terrorist activities against the Somali people,” Mack said. There were no U.S. aircraft involved in the Wednesday operation, Mack added. Garowe Online, a local news outlet that publishes articles from sources inside Somalia, first reported the operation late Wednesday evening on Twitter. According to that report, at least seven al-Shabaab militants were killed in the operation. The original tweet included a picture of what appears to be a light-attack helicopter with the letters “AU” on the right door. Those letters are a common abbreviation for the African Union, which is sanctioned by the United Nations to conduct peacekeeping operations in the country. Maj. Sheryll Klinkel, a Pentagon spokeswoman, identified the helicopter as an MD-500, which Kenya currently operates. The local news outlet later reported that U.S. forces were in a convoy alongside Somali soldiers on Thursday when their vehicles struck roadside bombs near Kismayo, followed by a short exchange of gunfire. However, the presence of U.S. forces in that convoy was not confirmed by AFRICOM officials. “I’m aware of the reports on the attack, but there were no U.S. personnel involved in that incident,” Mack said. Additionally, the airstrike conducted Thursday was not in retaliation for that ambush. “This was not in response to any particular mission. ... This was a target of opportunity, and all within the confines that [the Defense Department] provides us with authority,” said Samantha Reho, another spokeswoman for AFRICOM. The overarching goal for the Defense Department is to help the Federal Government of Somalia provide a safe and secure environment for the people of the country, officials said. “Violent extremist organizations like al-Shabaab and ISIS-Somalia continue to demonstrate their brutality and their rejection of a Somali society free of violence and oppression,” Mack said. “We are proud of the progress made by our partners, and look forward to continued gains against the enemies of peace and stability,” Mack added.